Working paper from UCL Institute for Innovation and Public Purpose (IIPP) explores the radical economic reforms in Estonia adopting digital technology in the public sector. Estonia’s transition to free-market capitalism and liberal democracy is marked by two distinct achievements: first, its economic success in terms of GDP, exports and FDI growth – all three have been best of class among the former Soviet economies; and second, it has been perhaps even more successful in digitally transforming its public sector, an achievement that is recognised globally as exemplary. It would be easy to assume that in such a small country these achievements spring from a common biotope of political ideas and actors. Instead, the digital transformation has relatively little to do with the free-market principles (Adam Smith’s famed ‘invisible hand’) that were behind its radical economic reforms. 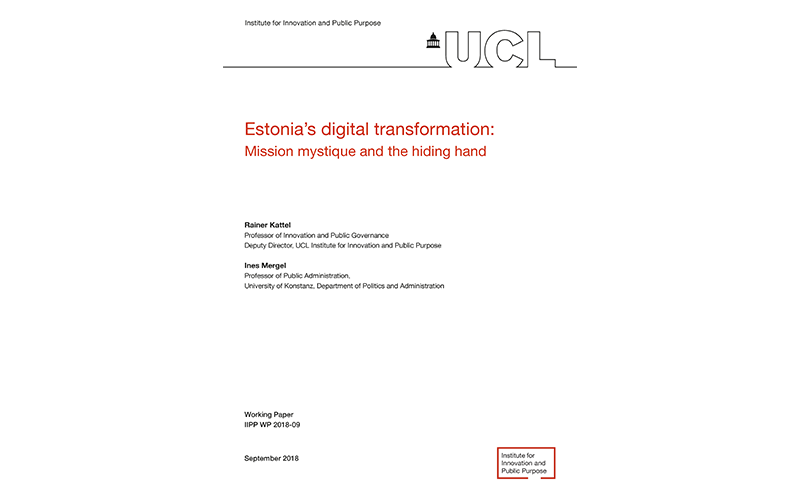 We argue that in adopting digital technology in the public sector, Estonia followed an entirely different principle of policymaking, best described as Hirschman’s principle of the ‘hiding hand’. This amounts to policymakers pushing visionary changes without anticipating all the challenges and risks involved upfront, an approach that sometimes results in unexpected learning, creativity and – in this case – success. The naiveté and enthusiasm of the hiding hand that propelled the initial ‘crazy ideas’ of the early 1990s became ingrained in Estonia’s digital policymaking culture, and created and relied on multiple highly cooperative, overlapping networks across public-private boundaries. The success, expressed mostly in universal public digital infrastructure and mandatory eidentification, created a ‘mission mystique’ that originated in, and is sustained by, public-private networks underlying several public organisations through multiple coalition governments over two decades. Perhaps paradoxically, Estonia’s success in e-government relied on these networks and their governance, as well as design principles, not being institutionalised and formalised. Herein lies the most significant challenge Estonia faces now: whether the foundations of past success – mission mystique – can deliver the next evolution in digital government and help create a more inclusive society. Keep updated with @IIPP_UCL on Twitter. This research stream aims to offer a new way of understanding the macroeconomic implications of market-shaping policies in terms of long-term investment and economic growth.